is a fantastic organization who believes all water is connected and is dedicated to the conservation of our oceans and freshwater alike. 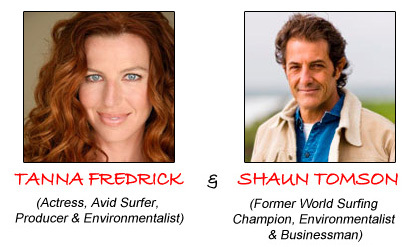 PSOS is made up of surfers, celebrities, friends, families, and businesses that create initiatives in support of clean water organizations both locally and globally. anyone who needs it worldwide. Funds go to help build a well for this amazing home providing full residential care for severely disabled kids in Gauteng, Africa. Our beaches and environment. Recently my sister visited me along with her nephew, who desperately wanted me to teach him to surf. We were saddened to read the large orange signs posted at the nearest beach that warned, “Contaminated Water: No Swimming!” My sister couldn’t believe what all us surfers and beach goers here in California know: that after any rain there is so much pollution in the water it can make you sick for days. 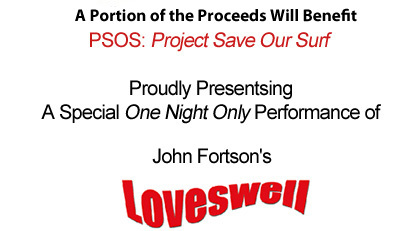 Thus, I am proud to work with Tanna, Shaun, & everyone at PSOS by donating all of the proceeds from this night's performance to PROJECT SAVE OUR SURF to raise monies for the their great beneficiaries this year. Thank you for joining me for what will be such a special night of Loveswell and may we all continue to enjoy & keep our beautiful oceans.